Teachers For Social Justice: Hunger Strike to Save Dyett High School in Bronzeville! Hunger Strike to Save Dyett High School in Bronzeville! 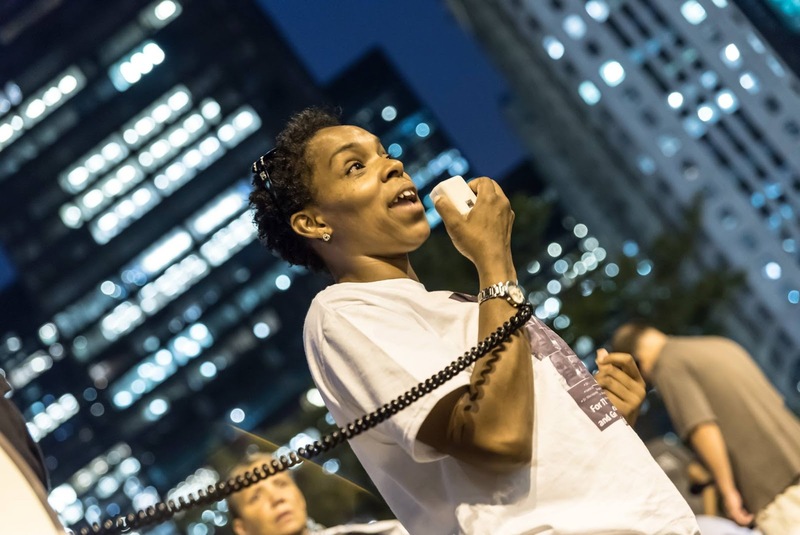 ANNOUNCEMENT: City-wide rally to celebrate victory and next steps, Tuesday, September 29, 5:30pm at the Thompson Center. 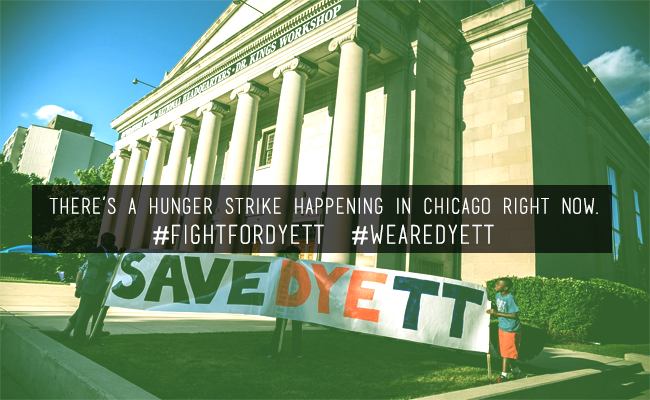 HUNGER STRIKE ENDS, but the #FightForDyett continues! 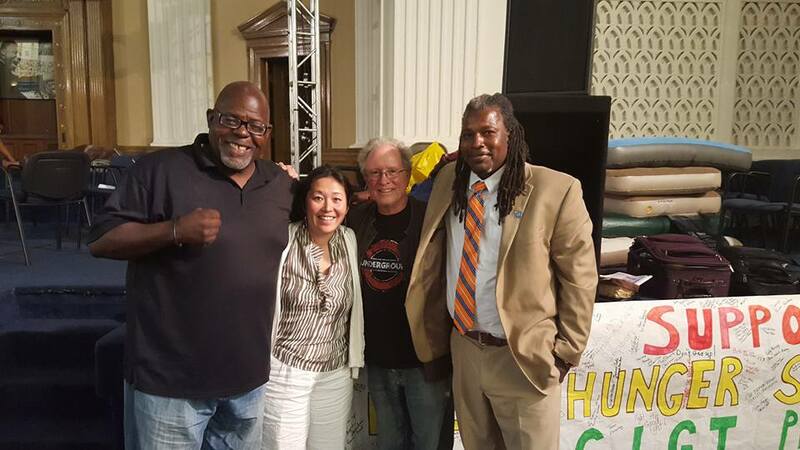 Speaking at Operation Push, Jitu Brown called an end to the hunger strike. The hunger strike is over, but the fight for a community drive sustainable green technology high school continues. 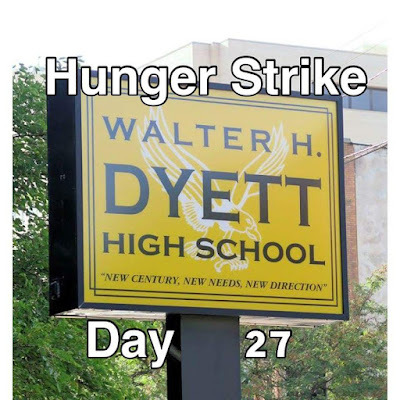 The hunger strike forced CPS to stop delaying their tactics and commit to re-opening Dyett as a publicly accountable neighborhood high school. The hunger strike prevented the privatization of Dyett but there is still work to be done. 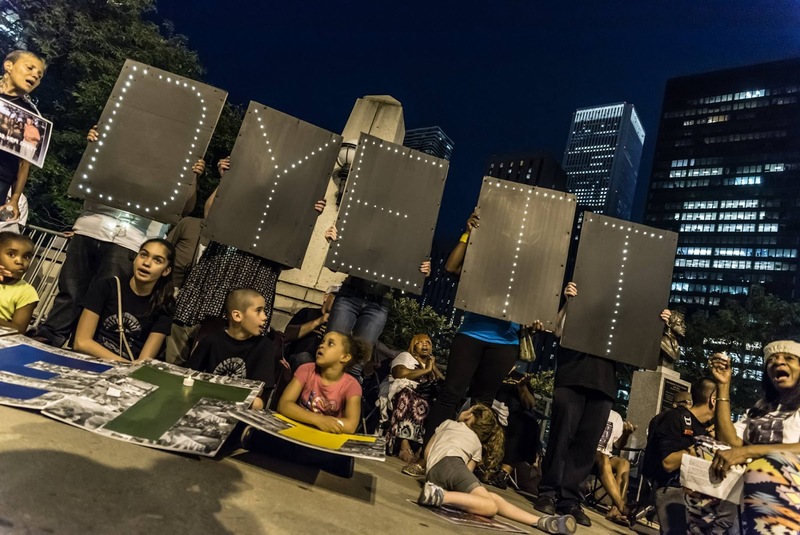 The #FightForDyett continues. 1. Yesterday I met with decision makers and they admitted that the block against our inclusion on the design team was alderman will burns. He sees us at the political threat and has stated that he wants us nowhere near the design process for the new dyett high school. He just doesn't get it. We will not lose. We will win for our children! 2. Last night was transformative in our work to build a movement in this country. Black youth project 100 led a March from the police station to demand justice for Rekia Boyd who was murdered by police officer Dante Servin to dyett high school where we blocked traffic and show the unity of connecting the fight for police accountability, a trauma center on the south side of Chicago and the fight for [dyett] high school as one fight. I want to publicly applaud these young people and let them know that I was moved like I haven't been moved in years. They have fueled my already burning flame and I look forward to changing the world with them. Please watch the video below. You will not be the same afterwards. 3. Please attend program at Rainbow PUSH this Saturday at 10 a.m. There will be an important announcement from the dyett hunger strikers. On Day 32 of hunger strike, Dyett hunger strikers convened again at Dyett H.S. 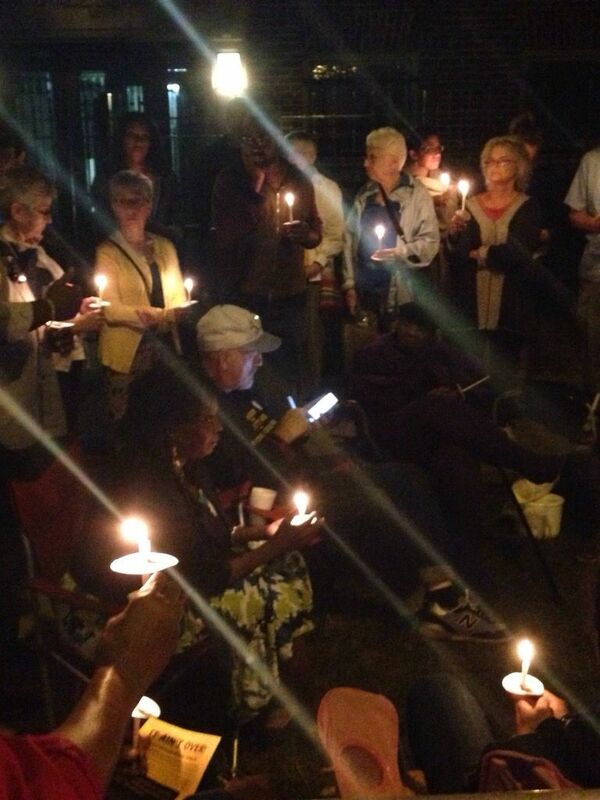 before leading a peaceful march to President Obama's house for a vigil. 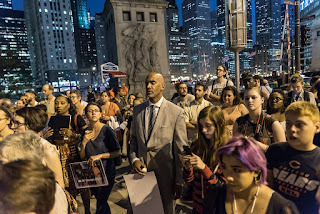 Check out these amazing photos from the vigil! 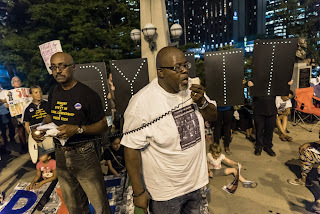 Watch "Chicago Tonight" on WTTW Channel 11 Chicago to see hunger strikers Jitu Brown and Anna Jones discuss their 31 days of fighting for Dyett. What would you sacrifice for a fully supported, fully public school? 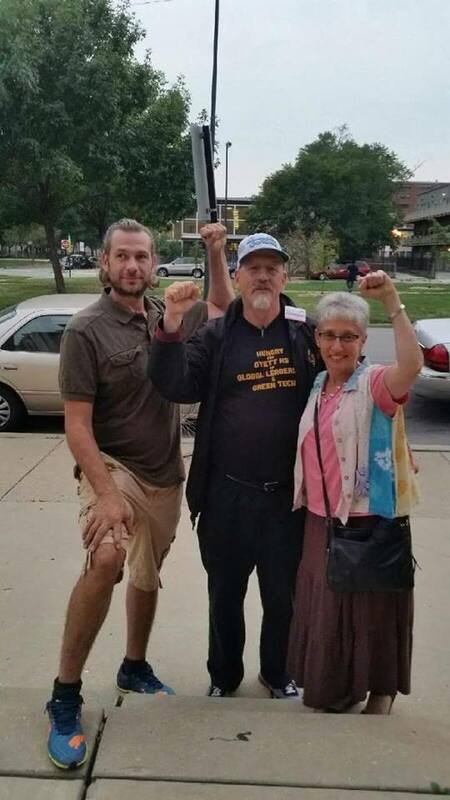 Two protesters end hunger strike due to medical dangers. Thirteen hunger strikers continue. Cathy Dale: "We are prepared to die. We're not going to go away. We're just not going to go away." 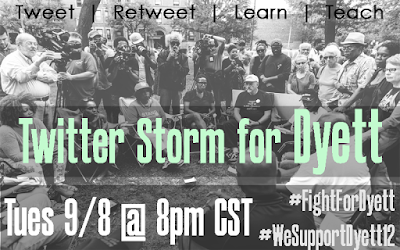 Help us get ‪#‎FightForDyett‬ trending on twitter: Tues 9/14 from 7pm - 9pm Chicago time. Spread the word to let people know we need as many original (not-retweets) tweets as possible from everyone's twitter handles. 1. Spirit is strong among the group. Bodies are weary. The fact that Rahm Emanuel doesn't care if we waste away fuels us! 2. Join us tomorrow for an all day vigil at the Mayor's office. City Hall 5th floor. 3. Press conference tomorrow at City Hall at 1PM. Join Us! 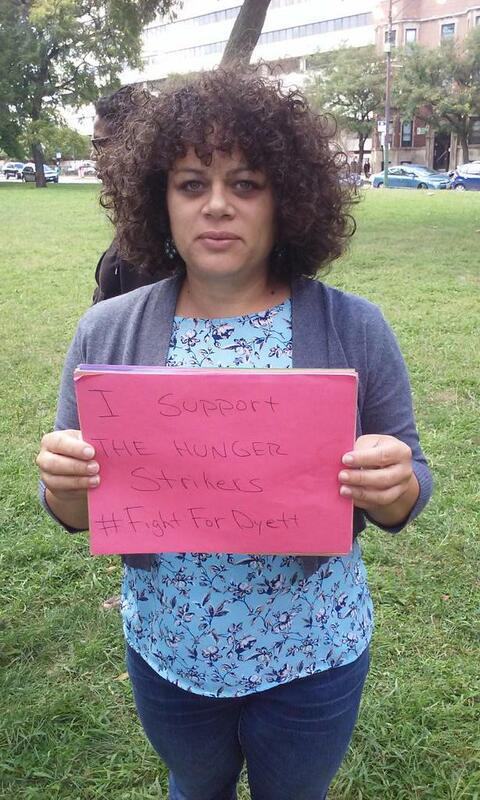 EXCELLENT IDEA from Dyett hunger strikers supporters! 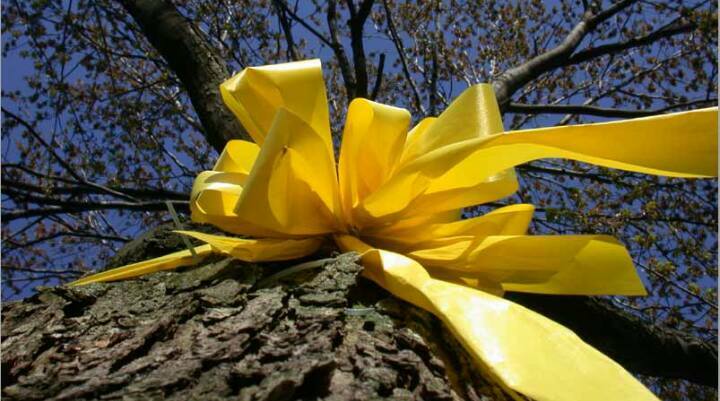 Let's show our support by placing a gold ribbon around trees in front of your house. Take pics of it so we can start sharing them. Why gold? 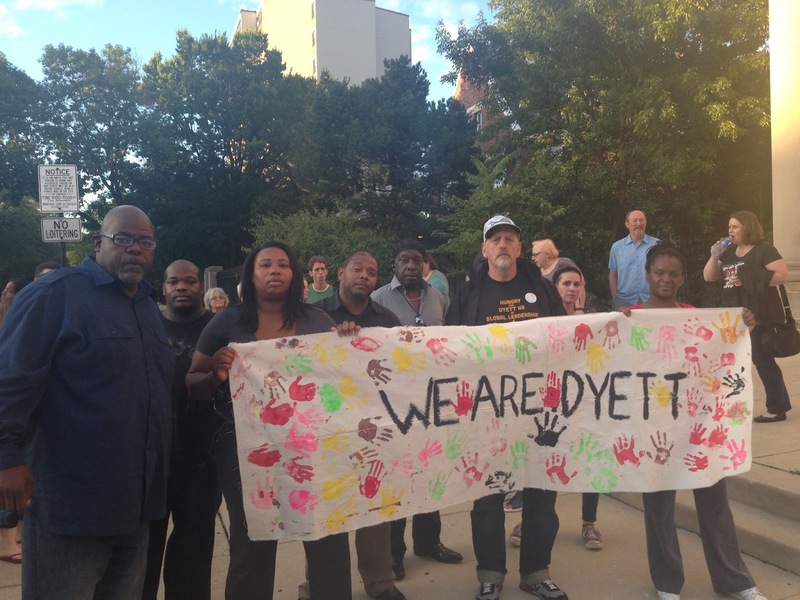 Because Dyett school colors are black & gold. 1. Yesterday was a good day. 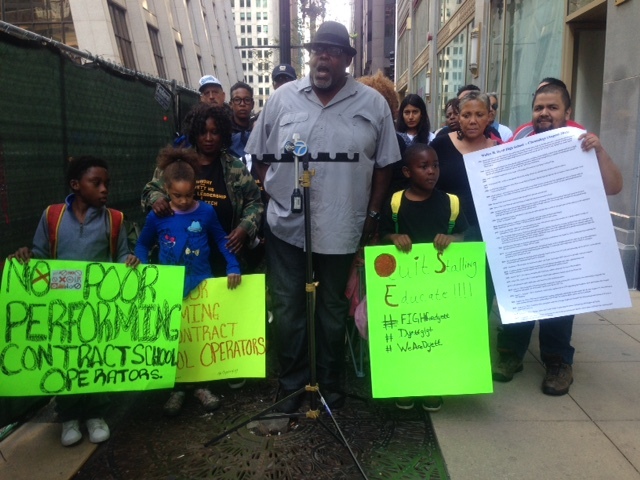 Not only did we expose Torrey Barrett in a press conference and sit in at Chicago Public Schools headquarters, we then sent a "hit squad" to confront Rahm Emanuel at the unveiling of a brand new 21 million dollar building as an annex to Lincoln Elementary School in Lincoln Park. 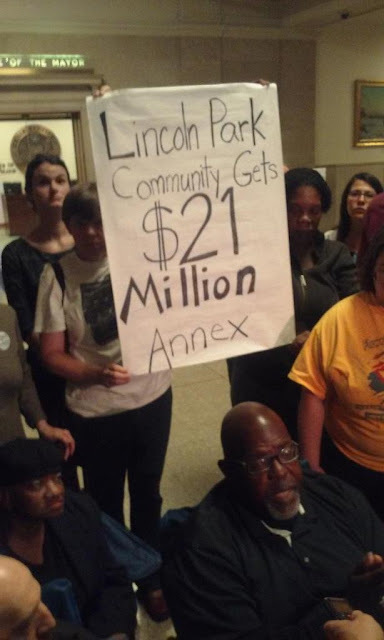 The fact that wealthy white parents in Lincoln Park can get a 21 million dollar addition without busting a sweat, a 21 million dollar addition that they didn't even need, and black parents on the southside of Chicago have to starve for the right to a neighborhood high school that reflects the community vision screams the need for an elected representative school board in this city. 2. 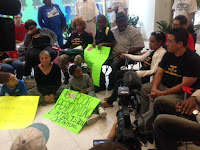 Hunger strikers confronted the mayor and he ran to the bathroom in order to escape dealing with his constituents. Then a group of parents hunger strikers and supporters caught up with will burns on the corner of 48th and Drexel. He could not handle the heat from his constituents and he escaped to his vehicle. 3. Today we were contacted by CPS. Talks have begun. We will keep you posted. 4. Mainstream media is not covering this story. This is about "Pastor" Torrey Barrett and the KLEO Center who paidindigent Black people $25 each to attend the Dyett school closings hearing in Januaryof 2012; to push for Dyett's closure. 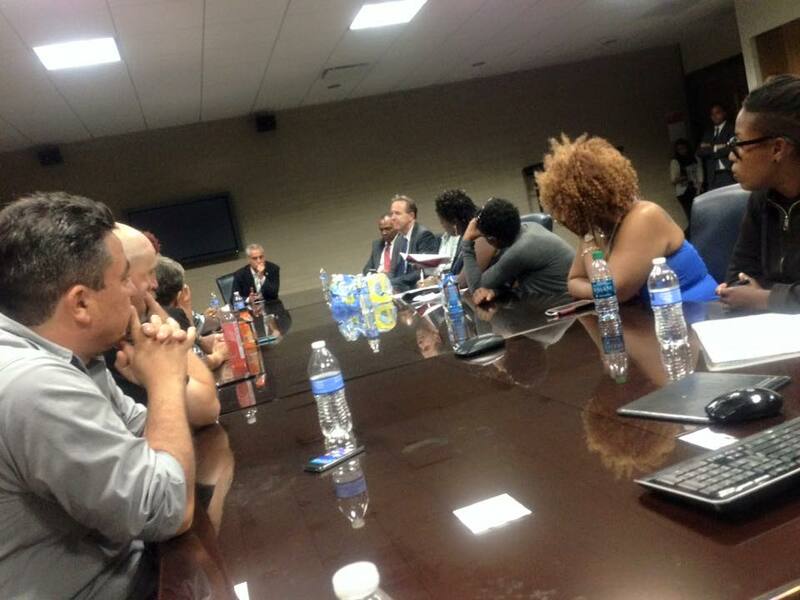 THIS is who was on stage with CPS CEOForest Claypool as the "community leaders" to plan the reopening ofDyett. PHOTOS! More photos from vigil held today! CLICK HERE! #FightForDyett Hunger Strikers attend ribbon cutting for $20Million addition Lincoln school on the North Side. It's not that they object to students having great resources... but ALL students should have access to great resources. After the time for a promised meeting came and went, the hunger strikers sat in at CPS. 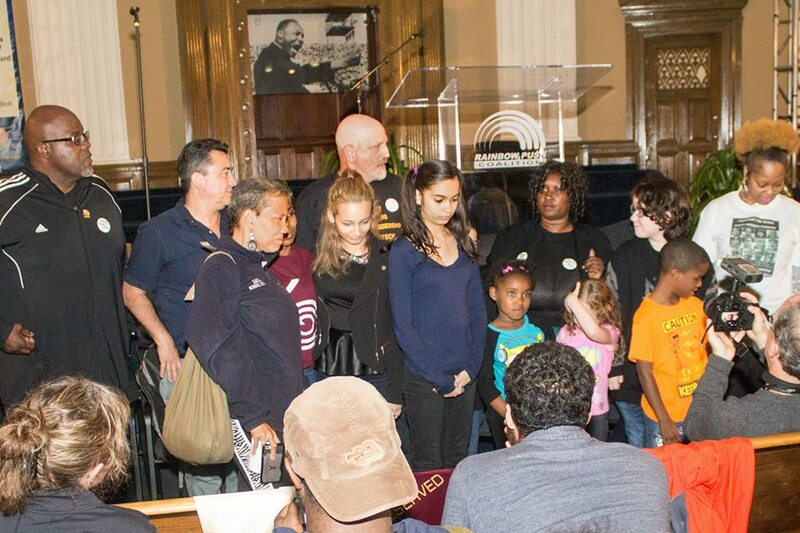 They prayed, again, for CPS leadership and Rahm to open their hearts and minds to the community's proposal. As hunger striker Jitu Brown says, "It's not a compromise if there was never any dialog in the first place." New Website! To take action for the #FightForDyett NOW go to www.fightfordyett.com where you can auto-send letters to your elected officials and donate much needed funds. 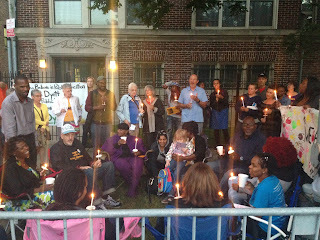 Can you find more photos of Day 24 & Day 25 vigil in this album: CLICK HERE! 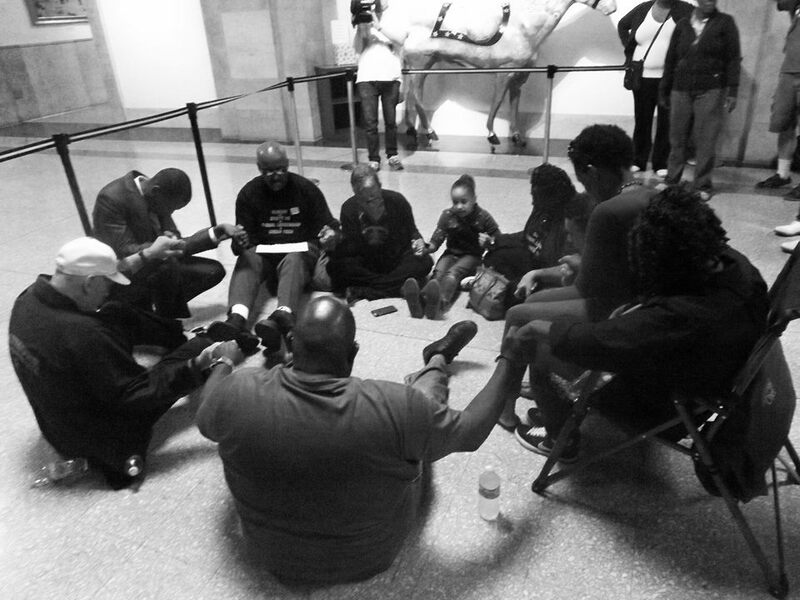 Three more join the #FightForDyett Hunger Strike! Brandon Johnson from the Chicago Teachers Union, Susan Hurley from Jobs With Justice and Asif Wilson from Teachers for Social Justice joined the original #Dyett12 today. 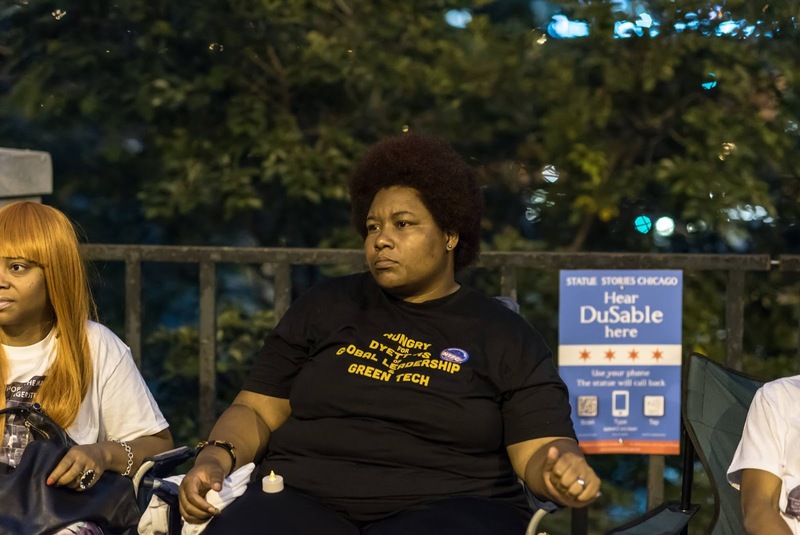 Brandon Johnson with the Chicago Teachers Union, Susan Hurley with Chicago Jobs With Justice and Asif Wilson with Teachers for Social Justice joined the hunger strike on Day 24. More photos from vigil! CLICK HERE! Our Twitter Storm was a huge success! 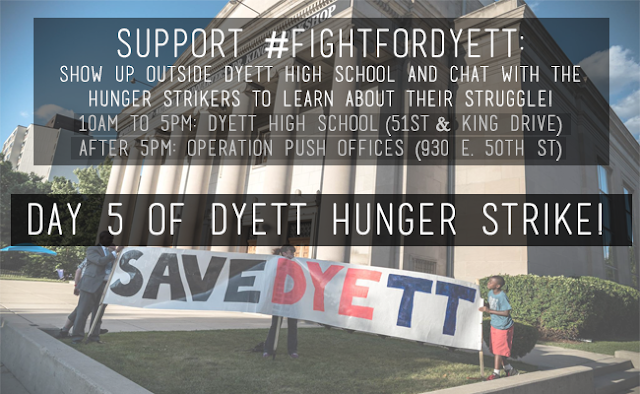 Show solidarity with the #FightForDyett hunger strikers today at 5:00. Photo Album from Day 22 of Hunger Strike! CLICK HERE! 1. Wonderful ceremony at Mt. Carmel MB Church. 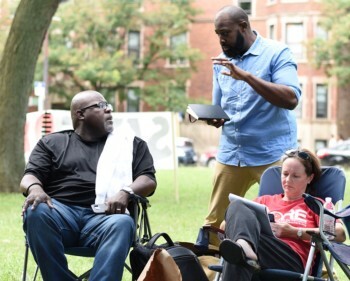 While other Black clergy have avoided this fight, or even advocated for and profited from Dyett's and other school's closure (Pastor Tori Barrett and the Kleo Center, Pastor Chris Harris from Brightstar Community Church), Pastor Robert Jones is a true man of God; humble, courageous with a generous spirit. I am proud to stand with him. 2. 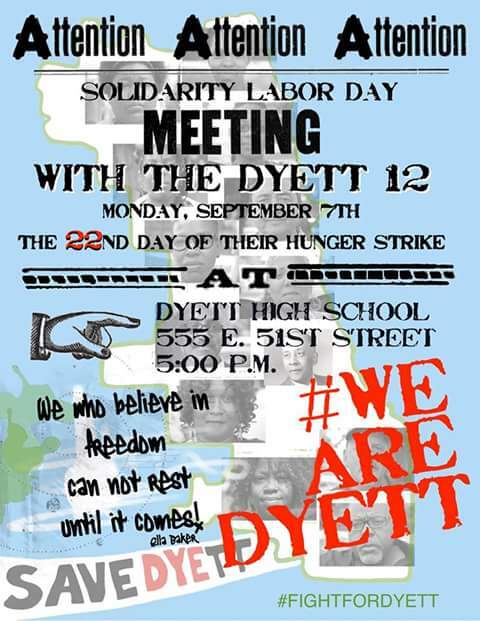 Please join us for a Labor Day "marching orders" gathering tomorrow at Dyett HS, 5pm. 3. 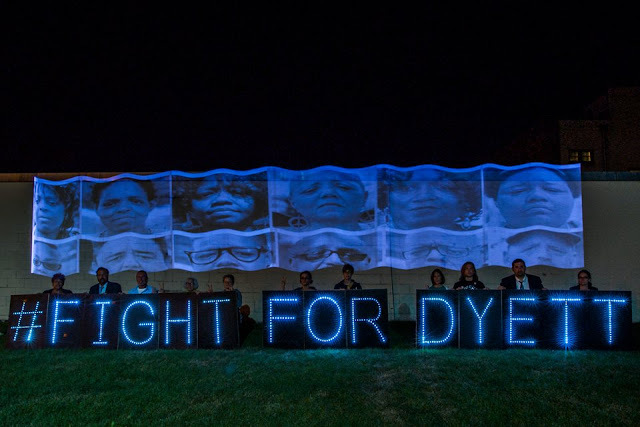 Starting Tuesday, we will be at Dyett from 1pm-6pm. Join us as we bring real victory to Bronzeville! A. We want Green Technology in the name of the school and the primary academic focus. B. 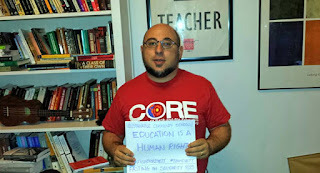 We want world studies and global leadership in the curriculum. C. The community selects the principal. 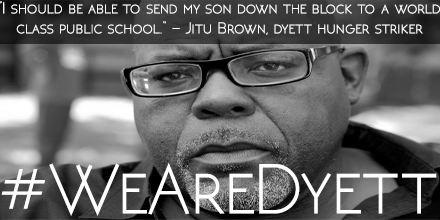 We want Mr. Duane Turner as the first principal of Dyett. D. We want our sustainable community school village with the 7 feeders who support our plan. E. We want Dyett to be a community school, open until the evening with programs for students, parents and community. 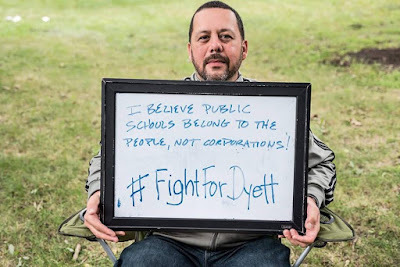 F. The pastors who helped to close Dyett and other schools and stood with Forest Claypool on Thursday cannot be involved with Dyett Design Team or programs. G. We want a fully empowered LSC when the school opens. The hunger strike continues! 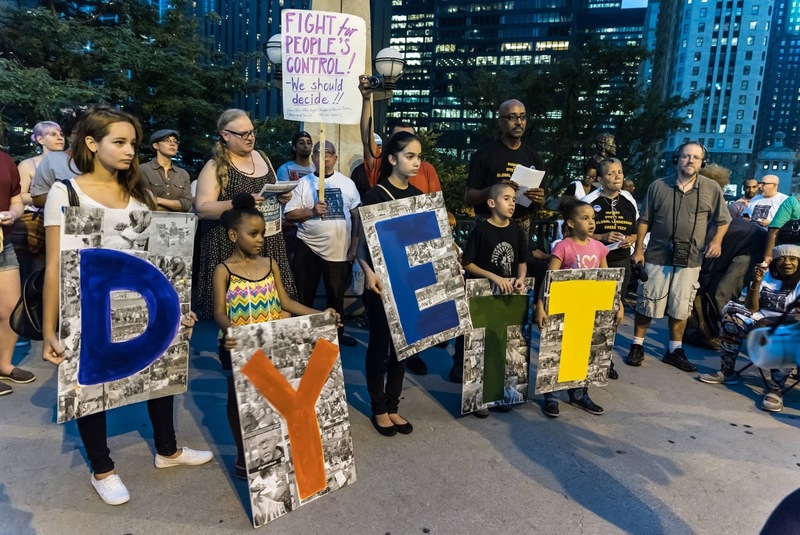 While it is good that Rahm has committed to re-open Dyett as an open enrollment, district run, fully public school; he did NOT accept any other aspect of the Coalition to Revitalize Dyett's proposal. 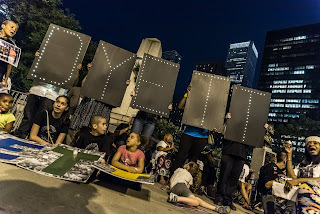 The #FightForDyett is not over! MORE PHOTOS FROM DAY 19! CLICK HERE! 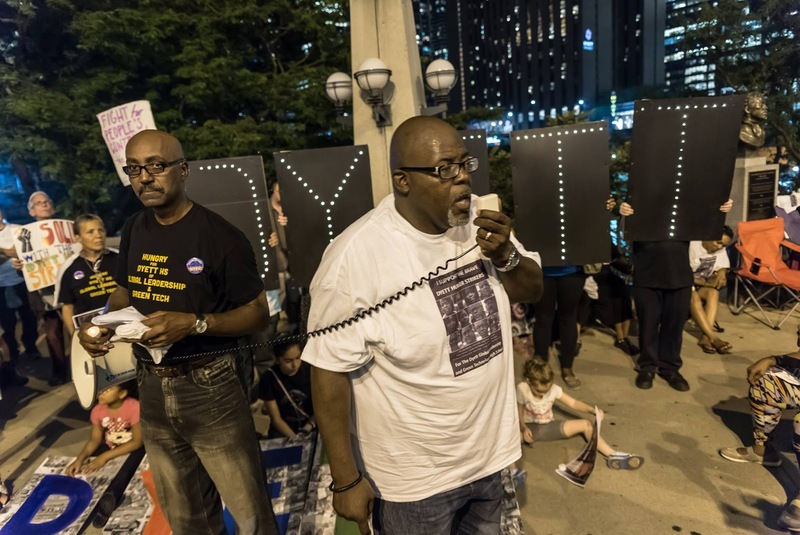 "Not good enough, the (#FightForDyett) strikers said in a statement issued through a spokesman. “This does not reflect the vision of the community,” the statement said. None of the leaders proposed for the new school in the CPS compromise plan “have been invested in the process. Many of them have existing contracts with the city or have been on the payroll. The mayor has lied to us and the taxpayers of this city. This process has been a sham from the beginning and was created to simply award the school to a private operator,” said spokesman J. Brian Malone." 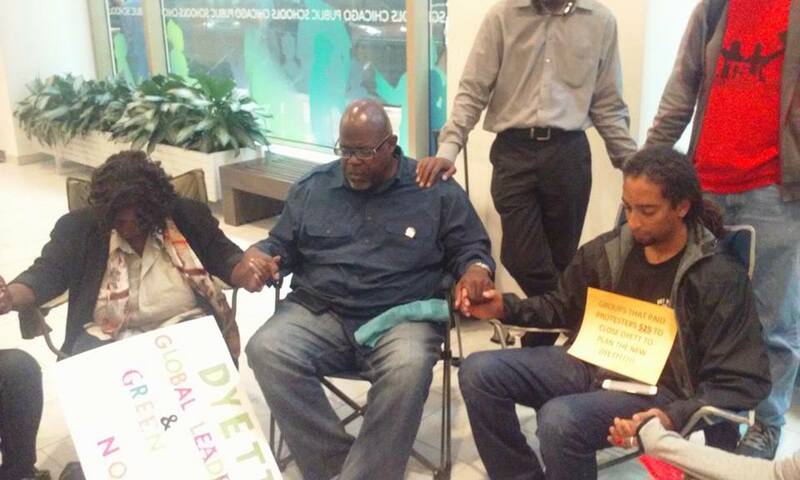 Dyett hunger strikers Jitu Brown and April Stogner take their fight to Washington DC! 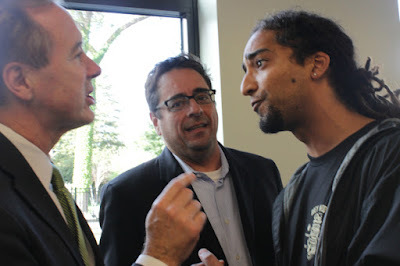 "Hunger Strikers and a few members of the Coalition to Revitalize Dyett High School Meeting with Rahm Emanuel, Forest Claypool (with several members of the mayor's staff) after the first of three public hearing on the 2016 city budget. The meeting was cordial, however, there was no definitive resolution. They 'need more time to make sure that they are making the right decision by our children.' The Hunger Strike Continues! 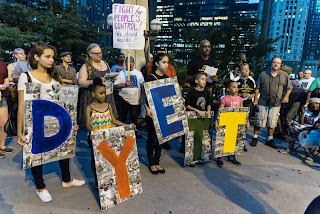 #‎FightForDyett‬ #‎WeAreDyett‬"
Vigil For Dyett - 7:30PM, at Tribune Tower by DuSable bust (Michigan Ave. & the river, just north of Wacker). 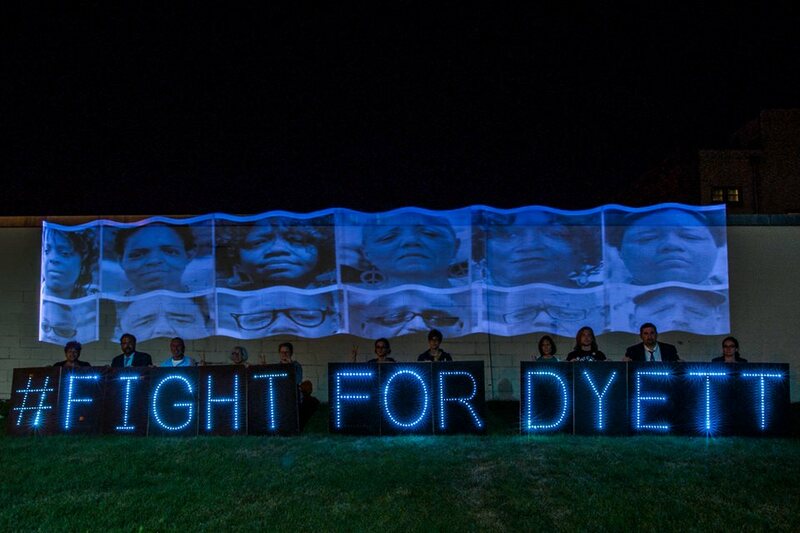 Join us for candlelight vigil with Chicago Light Brigade in support of the Hunger Strikers. 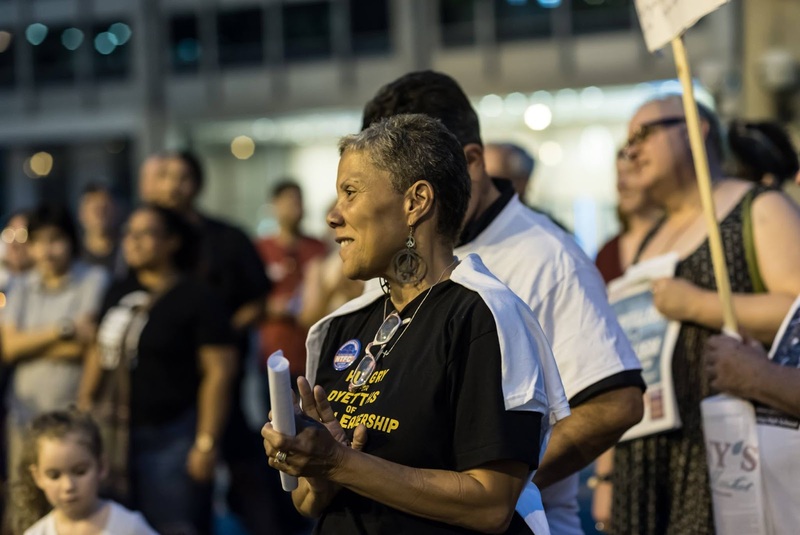 Help us pray and continue to build power behind the demand that Rahm Emanuel take action to end this Hunger Strike NOW! 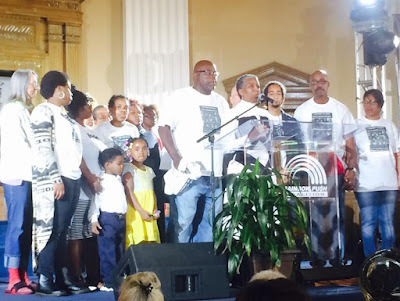 Clergy Press Conference 10:00 am 5th Floor of City Hall 121 N. LaSalle- Join an interdenominational group of faith leaders in laying out the moral case for honoring the Bronzeville community's plan for the Dyett Global Leadership and Green Technology HS. Speak your Mind at Dyett 1:00 pm - 555 E. 51st St.
Mzuri Moyo Aimbaye supports Dyett Hunger Strikes & performs her play "The Fannie Lou Hamer Story"
The Coalition to Revitalize Dyett invites you to speak out against the choices Rahm made: He gave millions to the bankers and corporations, closed clinics and schools, fine working people with fees; and about the choices he could make - progressive revenue options for the city. The Mayor has proposed an immoral budget that starves our neighborhood schools and communities while the Banks are feasting on taxpayer dollars and services. The City and CPS gave millions of dollars to Bank of America, $154 Million. That money could reopen 10 closed schools, including the Dyett Global Leadership and Green Technology High School. 1. Today we attend service at Mt. Carmel MB Church at 2875 S. Wabash. Last Sunday was food for the spirit as we were embraced by the people. Much respect to Reverend Dr. Robert Jones, a true man of God! 2. At 3pm, we have a video chat with parents and teachers from Chile, who are also fighting school closings. We will be at the offices of KOCO, 4242 S. Cottage Grove. It has been 2 weeks since we started this journey. The fight intensifies this week. We will be at Dyett daily from 10am-3pm. 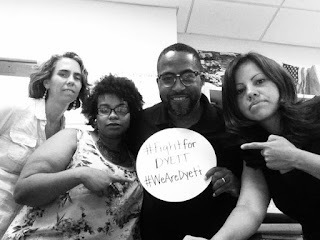 There are actions this week that you can connect to by calling Jaribu Lee at 773 548 7500 or following #FightForDyett on Twitter and checking the Dyett Global Leadership and Green Tech Facebook page. Thank you to Senator Kwame Raoul, Representative Mary Flowers, Commisioner Richard Boykins and so many others who showed their support this week. 1. Good day. 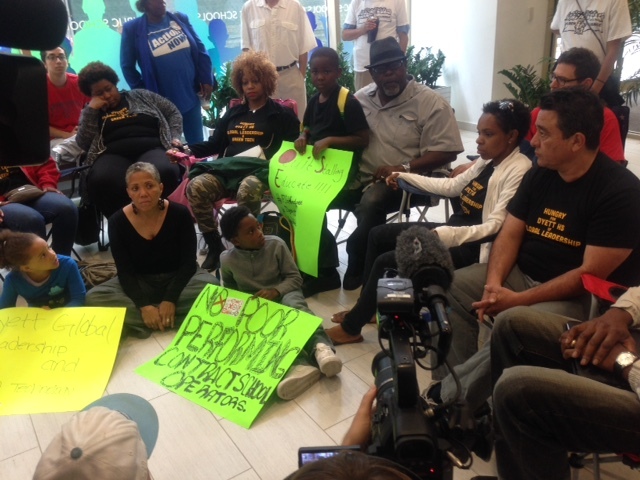 Hunger strikers held a press conference at city hall to refute message from city hall and cps. Delivered letter to Ken Bennett, Mayor's assistant. Good media coverage. 2. Wonderful rally/jamboree at PUSH Friday evening with close to 100 folks in attendance. We celebrated this struggle and the outpouring of love and support lifted the hunger strikers. 3. We were at Rainbow PUSH today at 10am for the broadcast. 1. King College Prep on 4445 S. Drexel is a selective enrollment school. Children in the neighborhood do NOT have the right to attend. Less than 10% of King's student's live in Bronzeville. 2. Kenwood Academy on 51st and Blackstone is not in Dyett's attendance area and is overcrowded. Hunger Strikers Anna Jones, Irene Robinson and Marc Kaplan speak to the crowd at #ChiRisingAug29 about the connection between police violence and the systemic violence against black and brown communities through the privatization of the public school system. "This is part of a global fight against the privatization of education," hunger striker Monique Redeaux-Smith, 32, an elementary school teacher and union activist, said on Thursday. 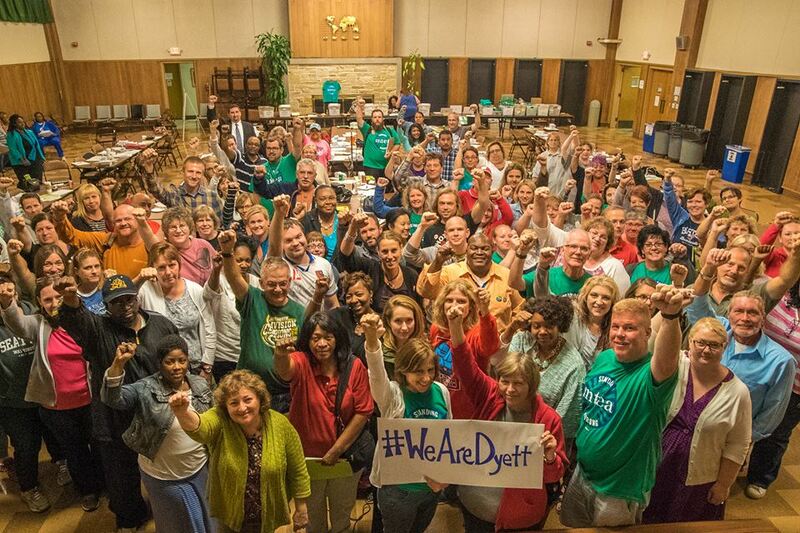 Although Chicago has closed dozens of underperforming public schools since 2013, Dyett has inspired years of passionate community support. That is partly because of its location at the edge of the Bronzeville neighborhood, a cultural mecca for African-Americans fleeing the South a century ago. 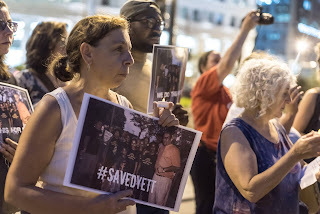 Without a neighborhood school like Dyett, protesters say, Bronzeville cannot battle years of black flight to the suburbs and attract families and businesses." Save the date... Thursday 9/3 at 10:00am. Details forthcoming. 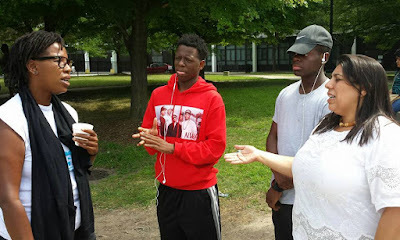 We must counter Rahm's claims that there are plenty of high quality neighborhood HS options for students in Bronzeville. 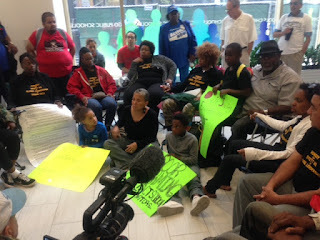 Sit-in at City Hall outside of the Mayor's office! More photos from today's action. CLICK HERE! Photo credit to TSJ member Ervin Lopez. 1. This is taking a physical and emotional toll on our people. My sister Jeanette Ramann was hospitalized yesterday after collapsing at the CPS board meeting. 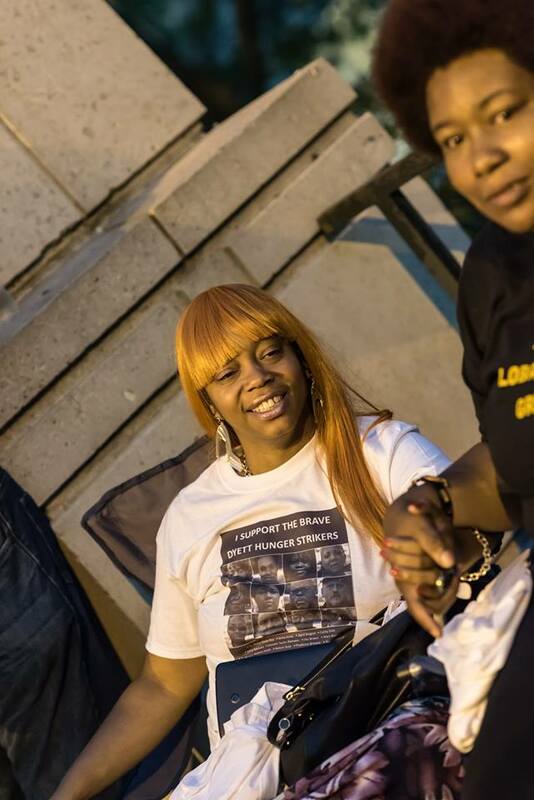 She is ok. She'll be released today and declared herself "still hungry for Dyett!" Ms. Irene Roninson, who was hospitalized Monday, was with us yesterday in powerful spirit, but she went to get some rest early in the afternoon. 2. We had a powerful press conference yesterday! Thank you to Commisioner Chuy Garcia, Reps Flowers, Martwick, Hernandez, Ford, and others. Thank you to Aldermen John Arena, Sue Susan Sadlowski Garza, Carlos Rosa and others. Thank you to the CTU, IFT and of course the AFT for your strong words and well wishes. We are breaking through the media blackout! 3. Unbelievable support from around the world! 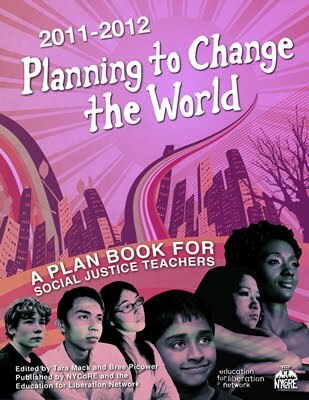 Thank you to my Journey for Justice family, Alliance to Reclaim our Schools, Equal Education in South Africa, Puerto Rican Teachers, BATS around country and all of you who are tweeting and posting on FB! We have to stay hot on social media! 4. A special thanks to my brothers and sisters in Little Village! You have walked the walk for Black and Brown unity! To Chuy, Alderman Munoz, Manuelita, Patty, Caro (thank you sis for bringing the BT youth), Fanny and everyone we love you. 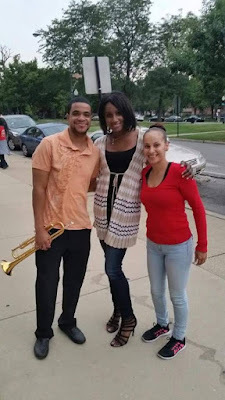 Bronzeville and Little Village are sister communities for real! 5. This Friday is a jamboree to celebrate this struggle, 5pm at Rainbow Push. Enjoy music, poetry, singing, testimony (no food!) Join us! This is so much bigger than the fight for one school. We dont know how long we will have to be on this hunger strike, but we are committed to do it until we win for our children and for the struggle for education justice! Stay with us! We need you! The hunger strike is taking its toll on the health of the brave hunger strikers. Two have been hospitalized. 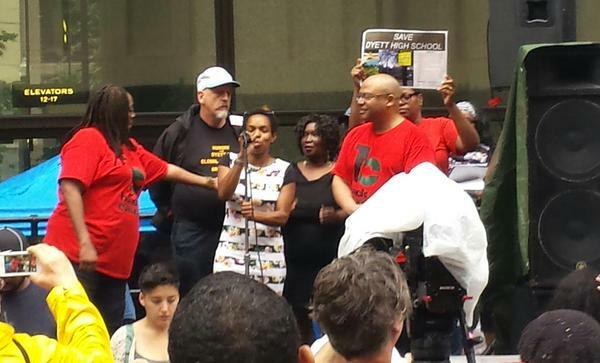 Jeanette Taylor-Ramann had to be removed on a stretcher from today's CPS Board meeting. 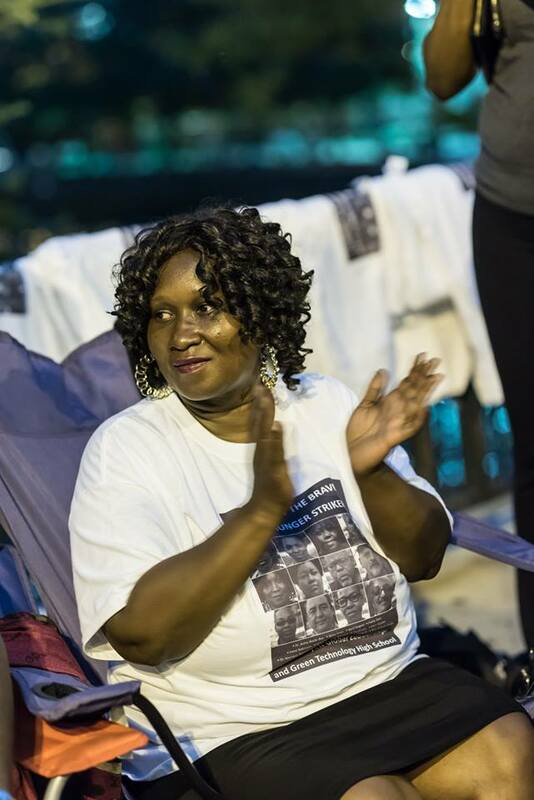 Irene Robinson was released yesterday and has vowed to continue her hunger strike no matter what. CPS school board members stated during their board meeting today that they owe the community an answer about Dyett, but it "may not be the answer everyone wants." The board was supposed to have the final public meeting about Dyett on Aug. 10 and make their decision today, but they've postponed the hearing and decision until September. AFT president Randi Weingarten and IFT president Dan Montgomery came to support the hunger strikers and the push for the Dyett Global Leadership and Green Technology HS. 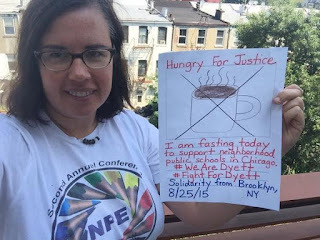 Hundreds of supporters around the US and beyond joined in one day solidarity fasts yesterday and today. 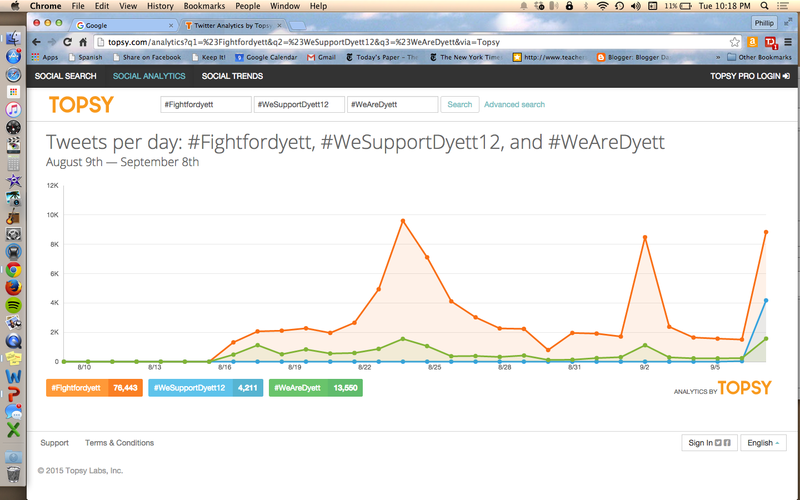 Social media using the #FightForDyett hashtag has exploded with over 36,000 tweets and many thousands of Facebook posts. 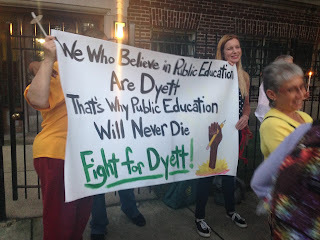 Former CPS teacher Eve Ewing wrote an incredibly thoughtful piece that puts the long struggle for Dyett into context. This is a must-read. Please share widely. People all over the world are supporting the #FightForDyett hunger strikers by doing a one day solidarity fast today. Post your selfie with a sign of support. 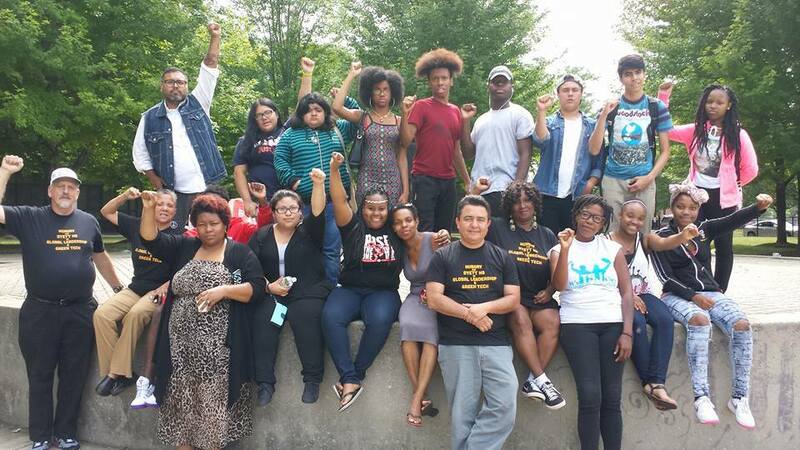 "Message of Strength and Solidarity to those Fighting for Quality and Equal Education In Bronzeville, Chicago. Your struggle is ours! #WeAreDyett For the past week parents, educators, and community residents in Bronzeville, Chicago, in the United States, have been on a hunger strike to force Chicago Public Schools to re-open their public high school, Dyett Global Leadership and Green Technology Academy. They have also called on those who can to join them in solidarity in their hunger strike for just today. 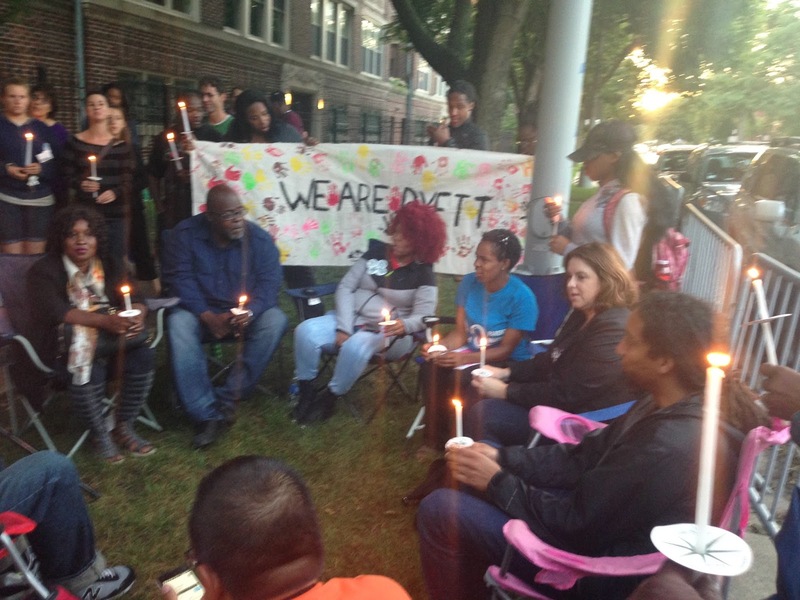 Dyett was the last open enrollment public high school serving their community and it was closed. Globally public education is under attack. Public schools are being closed in favour of privatized options. These schools have shown to either produce the same or worse results when compared to public schools. Many learners also have to travel much further distances to access these schools. All of this whilst billions of dollars are transferred from the public purse to private corporations. Poor and working class black communities around the world are disproportionately affected by this and by unequal and poor quality education. In today's globalised economy, the struggle for quality and equal education must also be global. 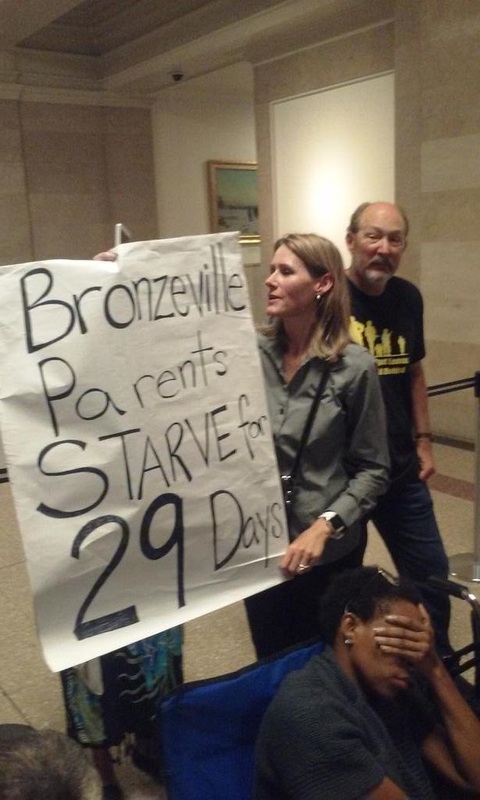 The struggle of parents in Bronzeville is the struggle of parents in Khayelitsha. Stopping rampant discriminatory privatization in the United States will slow down those who wish to do the same in South Africa. If they win, we win! For this reason, EE staff and members in Khayelitsha decided to send those struggling in Bronzeville a brief message of solidarity. You can follow the developments in this battle for quality public education and/or send your own message of support on Journey 4 Justice 's Facebook page. #WeAreDyett #FightForDyett #SaveDyett Phambili Dyett Phambili!" 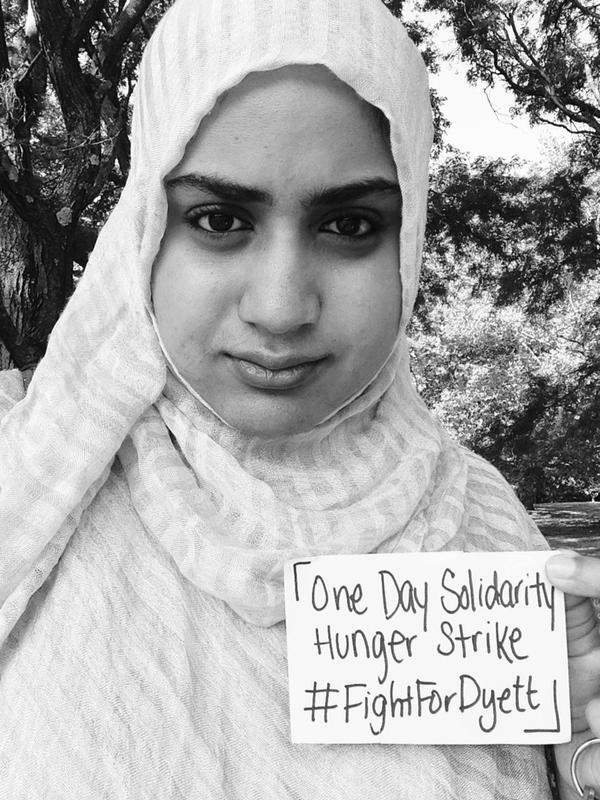 If you are participating in a #HungerForDyett one day solidarity hunger strike on Tues., Aug. 25 you can commit at http://salsa.wiredforchange.com/o/6041/p/dia/action3/common/public/?action_KEY=11586 to show your support. Hunger striker Jeanette Taylor-Ramann tells how her life has lead up to the crucial decision to put her health on the line in this fight. She explains how this fight for an open enrollment neighborhood school has evolved over the years. Solidarity Statements of Support are coming in from around the country and beyond: Check them out here. 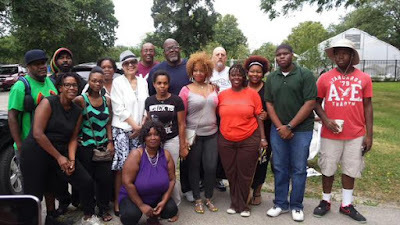 The Hunger Strikers started the day at Little Black Pearl the private arts organization that has proposed putting a privately run contract school in the Dyett building. 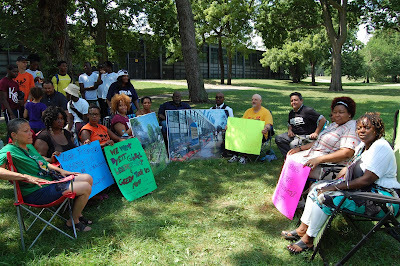 The #FightForDyett group asked LBP to withdraw their proposal. They did not. Back at Dyett there was lots of activity. Ald. Munoz came by to show his support, as did teachers from Lane Tech and many others. 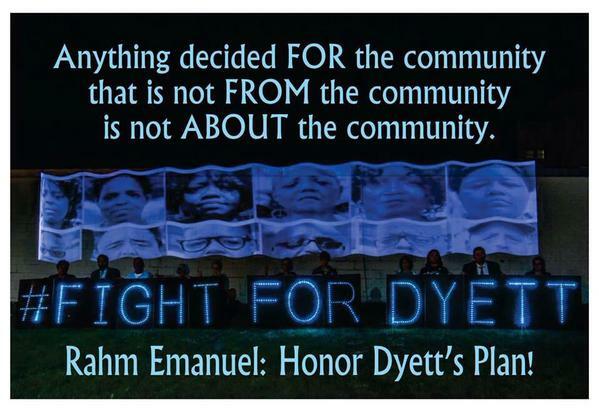 Artist and Educator Ellen Gradman produced a #WeAreDyett poster and began an interactive art installation. Here is a short photo album of Day 8. CLICK HERE! (VIDEO) Discussion with UIC Professor Pauline Lipman and Jitu Brown. Posted by the Chicago Freedom School: So much love, strength and appreciation to 9 of the coalition members on a hunger strike. 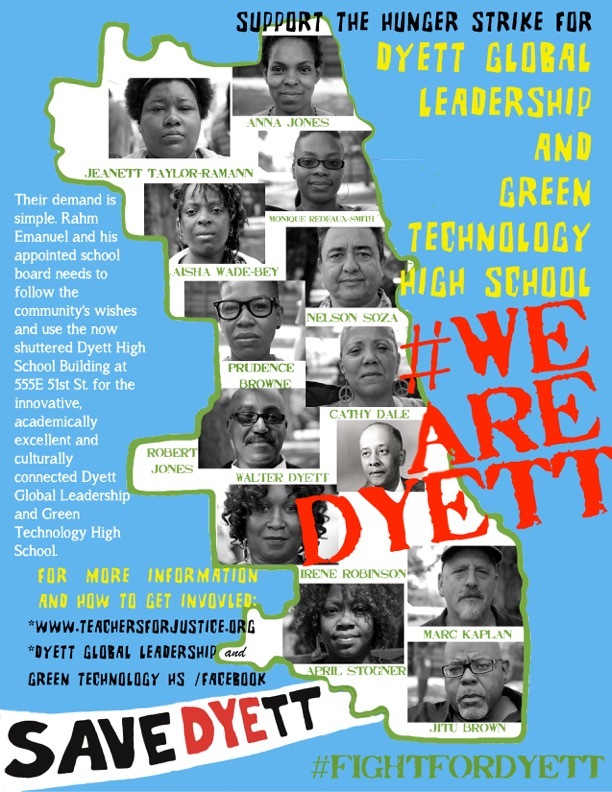 They took the time to share the struggle and passion to save Dyett Global Leadership & Green Technology HS. Freedom Fellows brought coconut water and energy to let community know we are in full support! 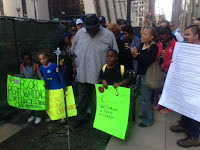 CPS teacher Michelle Gunderson talks about the "3 D's" of education privatization and asks how far you would go to guarantee a community based neighborhood school for your kids on the Living in Dialog education blog. 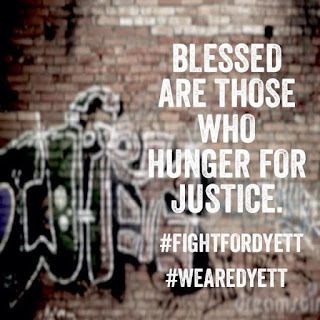 Dyett Parents Hunger for Justice Gets A Lot of Love on Day; Where is the media? 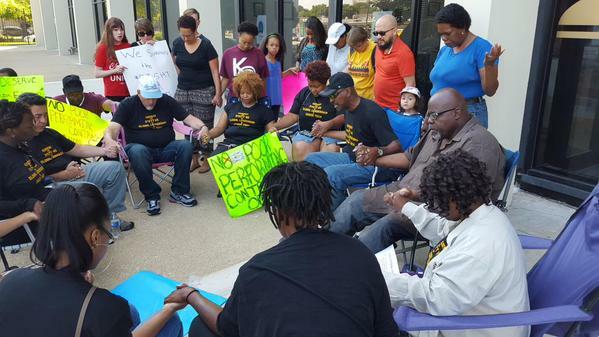 Hunger strikers and supporters held a prayer vigil at the offices of Ald. Will Burns and Rep. Christian Mitchell this morning. 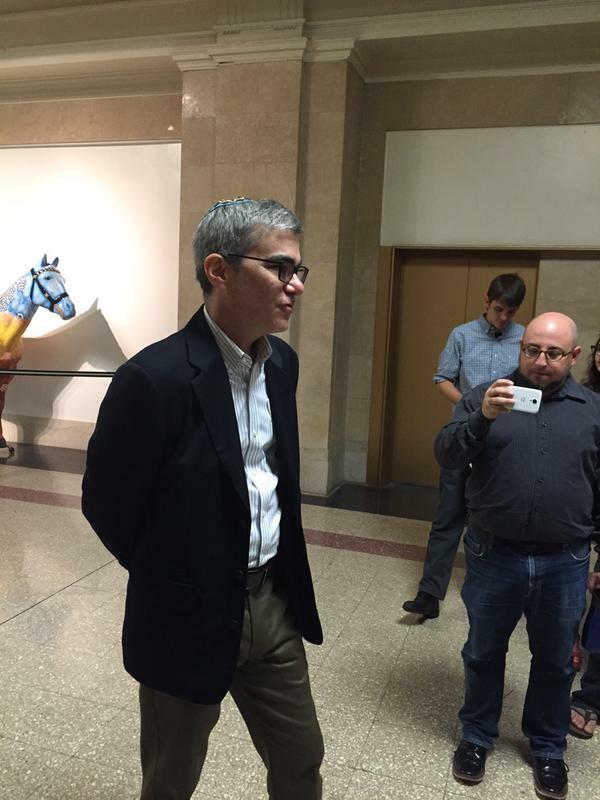 CPS teacher and parent Dave Stieber tries to explain the hunger strike to his 3 year-old. A short photo album of Day 5! CLICK HERE! Hunger strikers and supporters held a press conference in the morning in front of CPS and demanded CPS CEO Forrest Claypool to respond on Dyett now! Here is a short photo album of Day 4. CLICK HERE! Please Share! Photo credit to TSJ member Ervin Lopez & Dyett Coalition member Jaribu Lee. 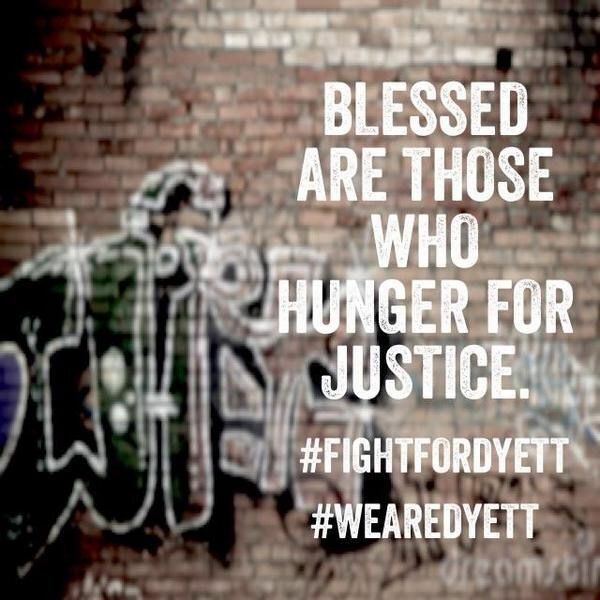 The #FightForDyett hashtag has been trending on Twitter ... help us keep it going. Brave Little Village hunger strikers refused to eat for 19 days in 2001 which lead to Mayor Daley agreeing to build a brand new innovative high school for their community. 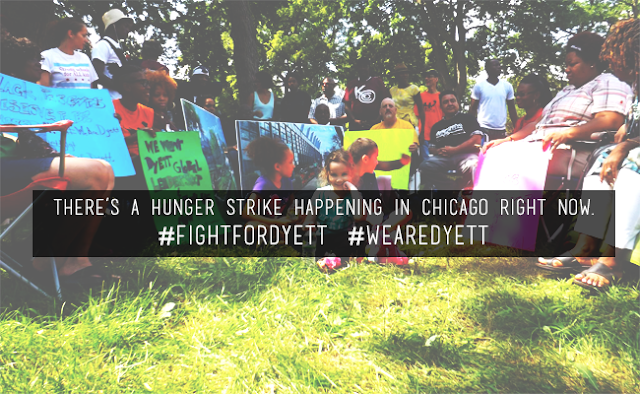 Two Little Village hunger strikers came to support the Dyett hunger strikers today. 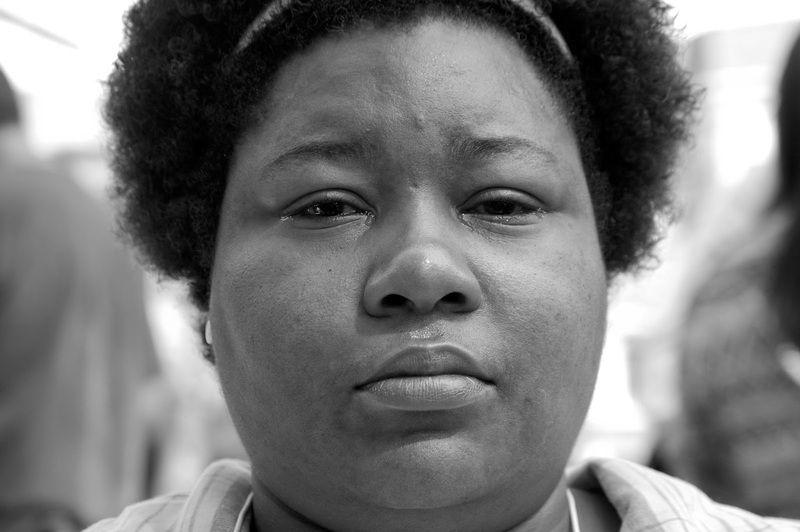 Here is a link to portraits of the Dyett hunger strikers. Photo credit to Phillip Cantor. Here is full album of Day 3. Click here! Please Share! Photo credit to TSJ member Ervin Lopez. 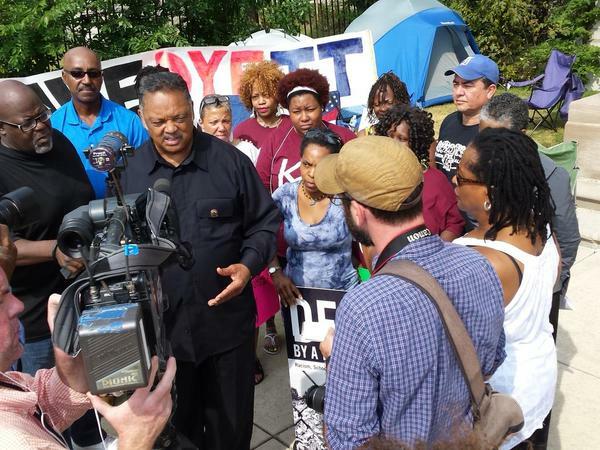 The Reverend Jesse Jackson has JOINED the hunger strike. 12 Parents, grandparents, community members and supporters from around the city started a hunger strike on August, 17th. 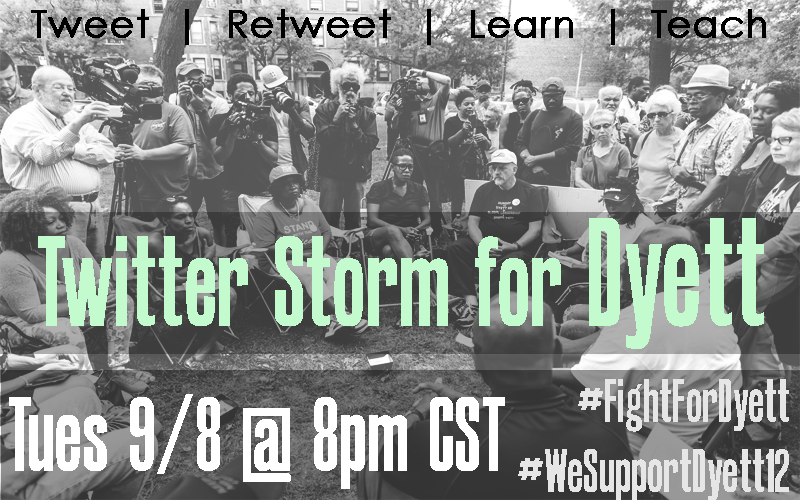 This page will collect links to media coverage and blog posts about the Dyett hunger strike as well as post selected videos and photos. If you come across something that should be on this page please contact Phil Cantor at mr.cantor@gmail.com. For a full photo album of Day 1 click here. Please share the photos. Please give credit to TSJ member Ervin Lopez. Come out and support these heroes. 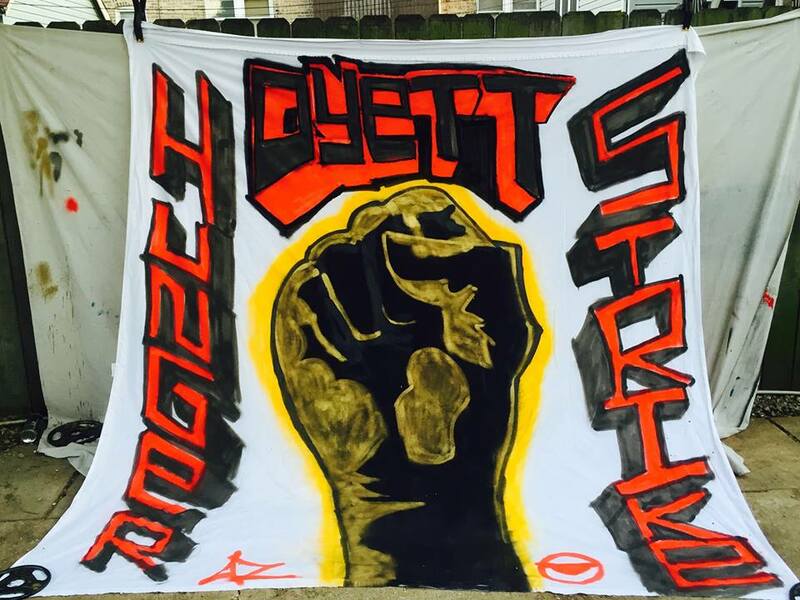 They'll be at the Dyett HS location unless there is rain when they'll be at the Rainbow Push Coalition's office at 930 E. 50th St.
Bring water, ice, fruit juice and your statements of solidarity to help sustain the strikers. 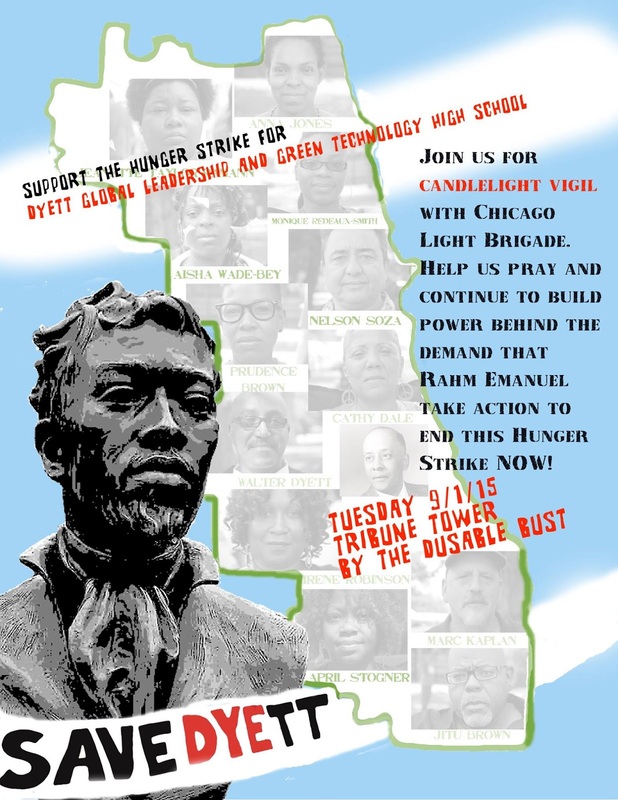 Call Mayor Emanuel at (312) 744 - 3300 and Alderman Will Burns at (773) 536-8103 and tell them that you support the Dyett hunger strikers and demand that he support community's wishes for the Dyett Global Leadership & Green Technology HS. Search the hashtags #FightForDyett and #WeAreDyett and follow TSJ on Twitter for updates @TeachForJustice.